Sasha Says: How Cool Am I? The Fan (Family Van) is now suitably pimped out (and quite dirty from the recent snow). Thanks Kate! I asked Mr. Sasha if he wanted one for the Accord, and he said no thanks. Party pooper! I think I'm actually the first in my town to get one of these, so I am super-cool and everyone is going to want to be like me. Or else make fun of me, it's still a toss-up. But I don't care- I love it! 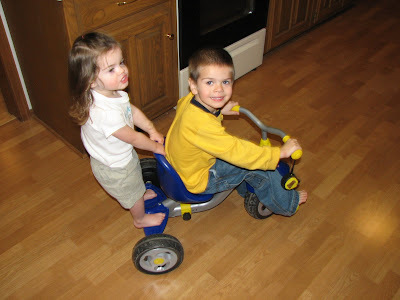 We also appear to let our kids drive tricycles around the house. Actually, this was right after Mr. Sasha got it put together a second time since I had to take it home because I found it on the playground not working properly. The kiddos were just giving it a test drive to make sure it was correctly assembled before we took it back to the school. 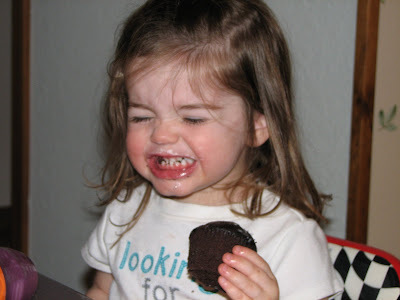 And also, I am raising a chocoholic. Maybe it's because I kept it away from her until age 2, but WC loves her some chocolate. Alas, year-end journal entries await. Hope I can get it all done and be back to post soon! Love the decal...I have this program on order for my store to start selling them so hopefully I'll have one of my own soon! I'm pretty sure my husband won't want one either! Glad you like it and it looks great on your car!!! I gotta say that other than little Ms. Abby, WC is the cutest little thing! They are both just adorable and if I was more warm, cuddly, and well, motherly, it would make me want more kids! So, um, if you decide to, you know, give away WC one day... I mean, all I'm saying is that NYC is surprisingly child-friendly (somewhat). Just saying. ooh fun! 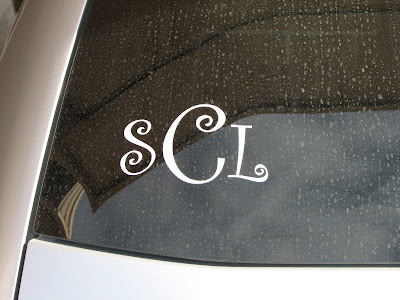 I got one of those monogram stickers for my new car too! You and Kate and you BFF-ness is making me crabby. I love these! I want one SO bad! My friends all make fun of me, but I think they are PRECIOUS!!! Your little girl with her chocolate is precious!